THUMBDOCK® positioning system consists of 2 high-grade stainless steel tables, one RIGHT-configured and one LEFT-configured. Each table has a set of color-coded Velcro® straps which are used to secure the appropriate portions of the forearm, wrist, hand and thumb to maintain the thumb in the correct position for surgery. 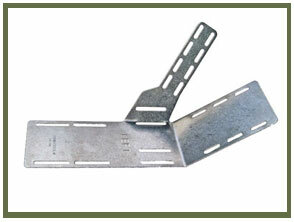 Each table has multiple slot selections for the straps, to facilitate positioning. THUMBDOCK® is compliant with FDA 510(k) regulations for a Class I exempt device. THUMBDOCK® was designed by an Orthopaedic hand surgeon to make operative life easier for himself and other hand surgeons. Any surgeon who does procedures on the volar side of the thumb, even seemingly simple cases such as A1 pulley release knows that this aspect of the thumb presents an awkward surface to position for easy surgical access. Particularly if help is limited such as for a single surgeon performing a procedure with a single nurse or scrub tech assisting, it can be difficult to maintain the thumb in proper position, hold retractors and retrieve surgical instruments needed for the case. Microsurgical procedures such as digital nerve or artery repair can provide a challenge for positioning the thumb and maintaining it in place without movement (such as shaking by an assistant supporting the thumb in position). THUMBDOCK® solves this by providing a rigid support to maintain the thumb in the proper position for most volar-sided surgery without the need for secondary support and without the movement of a human holder. 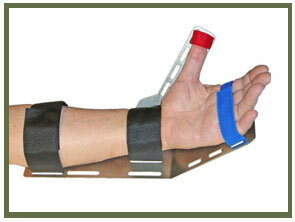 This frees the hands of the surgeon and the assistant(s) to use instruments, hold retractors and reach for instruments. With position maintained in the THUMBDOCK® there is no need for frequent resetting of the thumb to the necessary orientation for surgery. Once you try THUMBDOCK®, you’ll feel like you are operating one-handed without it. THUMBDOCK®… may… also be useful for other procedures which require maintaining the arm in a position with the wrist in either volar flexion or dorsiflexion, such as flexor or extensor tendon repair at the hand, wrist or forearm level. Of course, the decision of when and how to safely use THUMBDOCK® for surgery must be determined by the responsible operating surgeon. DURABLE, Rigid 304 stainless steel tables R& L configured. Table configuration maintains thumb securely in position for volar-sided surgery. Rigid structure eliminates need for secondary support such as that needed with a lead hand or piles of surgical towels. Single, solid piece construction of tables means no moving parts to lose or break and no fussing with adjustments. 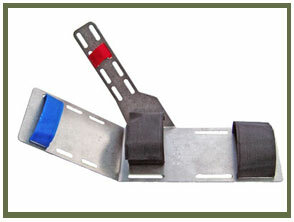 Easy to fasten, color-coded, paired Velcro® straps for quick positioning. 2 sets of 2” x 8” BLACK STRAPS for securing FOREARM & WRIST. 1 set of 3/4" x 6” BLUESTRAPS for securing the HAND. 1 set of 3/4" x 3” RED STRAPS for securing the THUMB. Multiple positioning slots for straps to allow proper adjustment. Easy to CLEAN AND STERILIZE BY STANDARD MEANS. 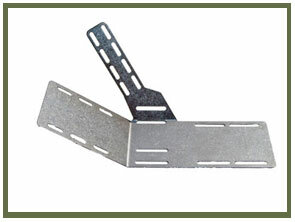 Clean & Sterilize for use, the appropriate R or L THUMBDOCK® & straps. Ensure that the metal table is cool enough for safe use before skin contact. Place a folded surgical towel between the metal table & patient arm for cushioning. 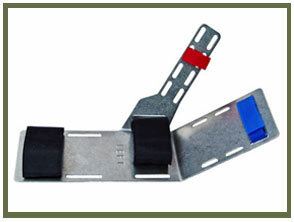 Set Velcro® straps to appropriate length by adjusting the amount of overlap of the hook & loop portions to form a strap of correct length for use. 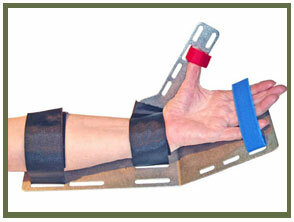 Position straps so that the softer (loop) portion faces the patient's skin. Use an UPPER ARM TOURNIQUET. Exsanguinate the limb before securing it in THUMBDOCK®. 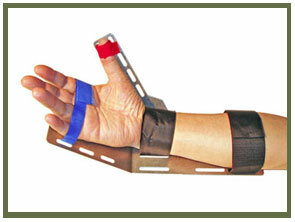 For surgery on the thumb, SECURE the WRIST in position FIRST, at the major bend in the table (2’ x8” BLACK STRAP), then secure the hand/fingers (3/4” x 6” BLUE STRAP ), then secure the thumb (3/4” x 3” RED STRAP) using the most appropriate slot positions and taking care not to secure the straps so tightly as to be constrictive. 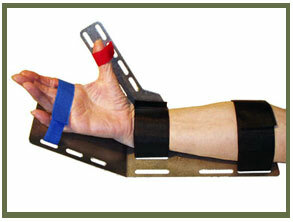 For many procedures, the most proximal 2” x 8” BLACK Forearm strap is NOT NECESSARY. Piles of surgical towels around the periphery of THUMBDOCK® to act as rests for the surgeon's hands may facilitate some procedures. Copyright 2006 RUNAMAX INC Med Products Division. All rights reserved.